Summary: The adjacent property owners to Irving Street, the Bigas-Valedon and Navarro's of 221 and 223 S. Jessup Street respectively, have filed in the Philadelphia Court of Common Please to gain title to the east end of Irving Street. We are objecting (see Legal) and contend that Irving Street is a public street and should be put on the City Plan to ensure public access for current and future generations. PARKING: The owners can park their cars on the cartway, as the Historical Commission has no authority over parking. PUBLIC ACCESS: The owners can deny public access, as regulating access is not in the Historical Commission's purview. The owners cannot legally deny access or egress to back properties of alleys that connect with Irving Street. The owners would need permission from all the back property owners to erect a gate or fence. (That's what we've been told, but not sure we would take that to the bank. What we've heard is that 221 and 223 plan to provide back property owners with a key to the gate they want to erect, and that would take care of the issue of egress. ALTERATIONS: The owners need is approval from the Historical Commission in order to erect a sign, gate, or any other structure (approvals that they may eventually receive). COST: The owners will acquire land 'for free' that is worth at least $150,000 (our approximate estimate), plus increase the size of their properties by 50%. It was suggested at the meeting that the street could be made into a pocket park. Many neighbors adamantly opposed the idea. After several months of neighborhood discord, the adjacent property owners appeared to drop the idea. Although it should be noted that in December of 2007, the attorney for the Bigas-Valedon's and Navarro's, Richard DeMarco, sent an email to the Philadelphia Historical Commission requesting information regarding the status of his clients historically designated houses and the historic cartway of Irving Street. The Historical Commission staff member responded that a permit was needed to install a gate across Irving Street. Irving Street, east of South Jessup Street, has been in the public domain for nearly 200 years. Together with South Jessup Street, they constitute one of the most unique and charming intersections for small historic streets in Philadelphia. This tiny crossroads is a gem. It is in the famous Philadelphia “Gayborhood” and a favorite stop for walking tours, artists, and photographers, offering that favorite "Kodak moment". It has also appeared in feature length movies and commercials. It is a landmark. The streets contained within the block bordered by Locust and Spruce, from 11th to 12th, are also part of the Philadelphia Historic Street Paving Thematic District, sometimes called the Historic Cartway, which includes the entire stretch of Irving Street. However, the protection afforded by the historic designation is limited, and applies only to the flat surface of the road, not curbs and sidewalks. More importantly, should the east end of Irving Street be privatized, the property owners can deny public access, and apply for permits to erect a gate and use the cartway as a carport. Although the east end of Irving Street may receive limited protection by the Historical Commission as a historic cartway, the Commission has control only over the flat surface of the cartway, but not the historic curbs and sidewalks, which are the property owners responsibility. Currently, the Bigas-Valedon's have blocked Irving Street with planters and the Navarro's have a garden where a sidewalk should be. Both property owners have curbs, which are their responsibility, that constitute a tripping hazard. (see photo). They have been asked to correct this situation, but so far, have refused to do so or even to respond to our requests. Should Irving Street be privatized, we are very concerned that current or future owners will restrict public access with a gate. Although we have also been told that the adjacent property owners have no intention to do so in the “near future”, that begs the question: If they don’t restrict access with a gate, how else would they control the alleged “nuisance behavior” and “illegally parked cars and trucks" that they have complained about in the past? And although the Historical Commission has told us that they will, more than likely, not allow the street to be gated, the adjacent property owners or future owners, can appeal that decision and ultimately prevail. Why should the City of Philadelphia and its citizens take that risk? 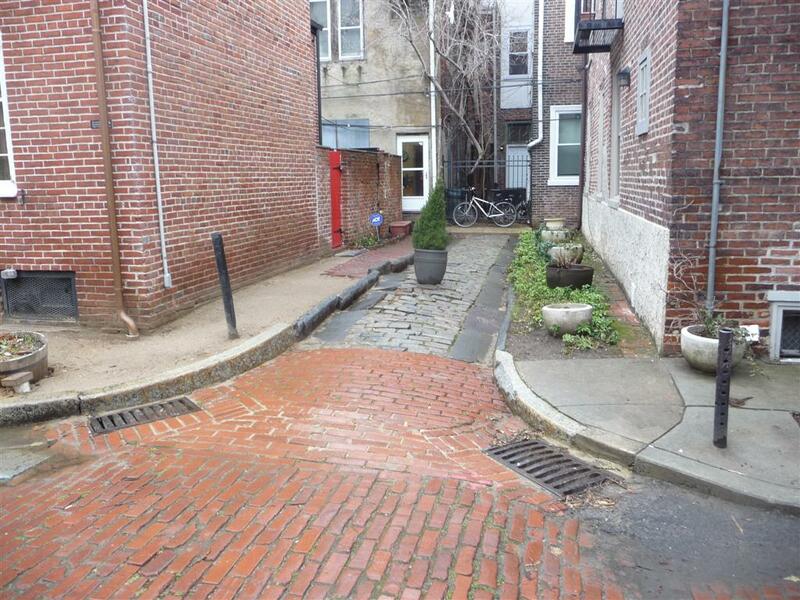 We believe that in order to keep Irving Street in public hands, thereby preserving its historic integrity and guaranteeing it remain a street open to the public, the City of Philadelphia should take the necessary steps to put it on the City Plan. We would very much welcome any support you may have to offer (see writing tips), including financial assitance. Also, please visit our legal Summary and research page, which charts the history of Irving Street. It's an interesting look back in time. Our supporters include: numerous neighbors (see letter to Weekly Press), other Philadelphians and visitors (http://www.ipetitions.com/petition/irvingstreet/), The Association of Philadelphia Tour Guides (http://www.phillyguides.org/), and the preservation group - SaveOurSites.org.